Inspire competition, promote a positive store image and give students an added reason to sell books at your buyback with a "Books for a Better Community" event! Student organizations will compete to raise money for charity during your buyback. Each student who sells their book at your store will have the opportunity to vote for the organization of their choice, encouraging each participating group to promote your buy to their fellow classmates! In the end, the organization that receives the most votes will be awarded with a donation made in their name to a charity of their choice! What type of organizations can participate? The Greek community could be a great place to get started! Because they are often very connected on campus and are required to participate in philanthropy projects, this community creates ideal unofficial marketers for your event. When can they start? How long do they have? We suggest you run the competition throughout buyback. Where are participants allowed to promote to students? 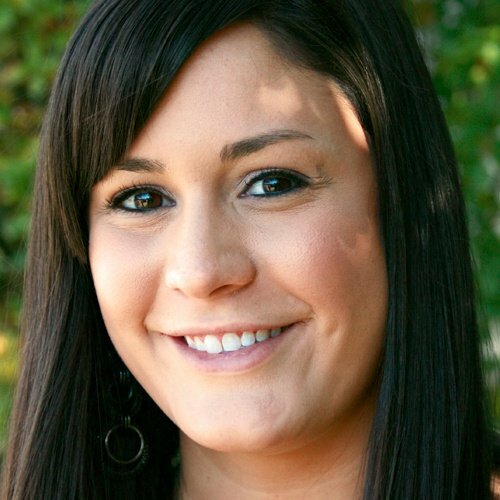 Consider limiting promotion to outside the store, to avoid crowds. Advise students not to market their cause while a class is in session to eliminate the chance of disruptions. What kinds of messages can they include? Ask students to include your bookstore’s name in all their promotions to reinforce buyback. Next, assign prize amounts for the winner(s). You can either set designed amount such as $500 for the group who has the most votes, or donate a dollar amount based on the total amount of votes, such as $1 per ticket collected. You can also consider awarding each participant in decreasing amounts, such as $250 for the first place winner and $150 for the runner-up. It's all up to you! Consider creating custom ballots where students can write in the name of the organization of their choice. Each student can then cast their vote in one designated box. If you choose this option, include a space for students to write-in their email address, so you can connect with them for future promotions. Because you have to sort the entries at the end, however, this method will require a bit of extra effort. For a streamlined approach, try setting up a table near the buyback counter housing one box for each organization, labeled with their respective names. With this option, simply hand out a standard ticket to each student at the buyback counter and have them place it in the box of their choice. Integrate all of these details into an informational flyer, with an included entry form, to distribute to possible participants. We've made it easy; click here to download a customizable template. Hand out or email your informational flyer to each student involved in on campus organizations, describing the goal of your promotion, as well as the benefits. Make sure you attach a participation form and your specific rules, too. Reach out to other departments on campus, such as Residence Life or Greek Life as they may be interested in helping you promote the event! To help in the process, we created a customizable flyer that you can offer organizations to help them spread the word! All they have to do is personalize the sheet with their information and your buyback dates and times! Prepare for the competition by equipping each buyer with your designated choice of ticket. Then, set up your voting station. Make sure the area has plenty of signage so students are clear on how and where to participate. Have fun with the promotion by making your voting station a central display within your store, to draw attention to additional merchandise. Your participants will start promoting your buyback to students across campus, so help out by advertising along with them! Fuel competition on your social media sites by posting updates each night, announcing which organizations are leading the race. Or, try posting short biographies on each organization, how they are promoting, and why they chose their designated charity, to help undecided students place their votes. Team Gamma Phi leads with 124 votes! But Team Phi Kappa Theta only needs 10 to catch up! Keep the competition going - sell your books and vote today! Have you voted in the Books for a Better Community drive? It’s easy! Stop by, sell your books, get a ticket and vote to support the charity of your choice! YOU can make a difference! 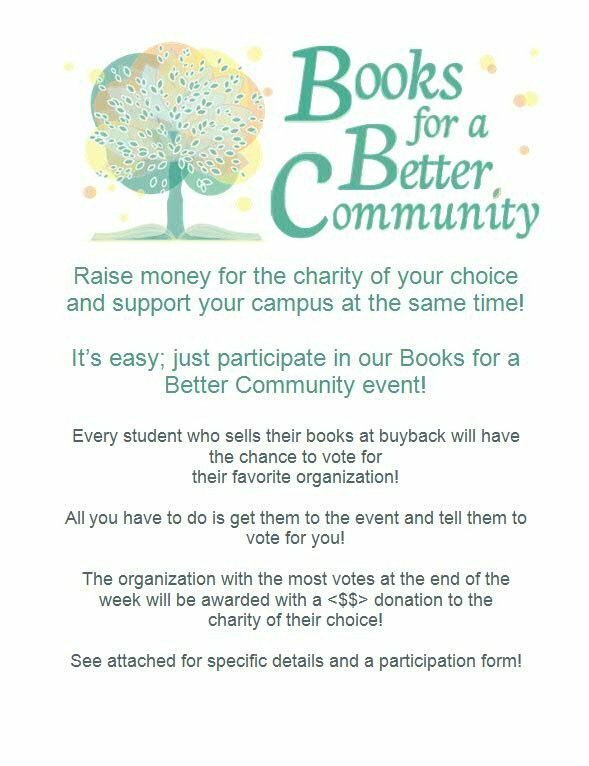 Sell your books @MBSbookstore and vote to support your favorite charity or organization! Don’t forget to update your website and other online resources with relevant information about the competition, too. Congratulate the winners by publicly announcing them on your website, social media, and through in-store signs! Create a certificate commending them for their philanthropy efforts that they can then display in their organization’s meeting place, and be sure to include your store’s name on it for further publicity. Alert the local media of your store’s partnership with students to raise money for charity, detailing how much was ultimately donated. Then, congratulate yourself on accomplishing an event that allowed you to increase participation in buyback and enhance your store’s image!